fashion – This Square Peg. Are y’all familiar with Chip and Joanna Gaines? I’m sure your mother has also gently forced you to watch back-to-back episodes of Fixer Upper on HGTV when she knows that you’re positively allergic to anything having to do with home constructions, DIY, building, terms like rebar and backsplash, so on and so forth. Anyway, the popularity of their show led to the Gaines’ expanding. Magnolia Market at the Silos has a bakery/store/etc., and the Magnolia Table, which I’m far more interested in, has breakfast served all day. So, yeah, I need to go to there. Not just for the breakfast, but the look and feel of the buildings, both rustic and clean, are calling out to me. This need may happen pretty soon, though, because the Magnolia Marvels are all located in Waco, TX, which is about an hour and 30 minutes away from me. Huzzah! Aren’t they lovely? I need a KitchenAid mixer, y’all. And I need it now. But, wonders the eagle-eyed reader, will she even use it? Why, yes, indeed I will. Hey, look, I’m not known for my kitchen anything prowess, but I love to bake (fun fact; I used to bake a ton when I was younger), and I feel like that mixer will come in handy for experimenting overall in the kitchen. So, yeah, if you want to donate one, send it to P.O. Box This Square Peg. Because these things are pricey. Remember this gorgeous retro swimsuit from TICN #8? Welp, it’s not a need anymore because…I bought it. Pics coming soon on how it looks on me. The colors are a bit different, but it’s essentially the same outfit. We shall see. This is huge, folks. I don’t wear two-piece swimwear. And when I do, it generally involved a giant T-shirt and shorts. But the Summer of This Square Peg doesn’t call for hiding, does it? June 14, 2018 June 14, 2018 Categories Beauty, Fashion, MeLeave a Comment on i didn’t look pregnant! Party people: I rarely wear jumpsuits. Because when I do wear them, I look with child. And since I’m not with child and haven’t ever been with child, you can imagine me wanting to avoid appearing that way when it comes to my personal style. Nevertheless, while at Ross a week or so ago, I came upon the jumpsuit you see above and it really delighted my eye. The pattern, the texture–everything. My friend, who was shopping with me, gasped. “You have to buy that! It’s so cute!” Me: But I’ll look pregnant. “You won’t!” Me: I will. Every jumpsuit I’ve ever owned or worn–with the exception of like, one–has created a weirdness in my mid-section area, creating an illusion that I certainly wasn’t looking for. Hence my reluctance. But my friend’s encouragement won me over. 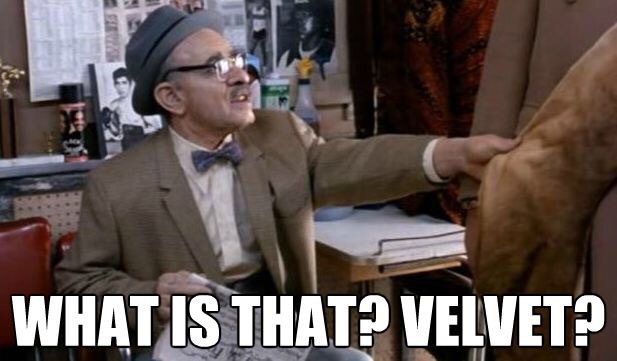 Fast forward to me wearing the jumpsuit for a graduation this past weekend and happily discovering that it was lovely and non-pregnant looking! Here’s to taking tiny risks with style and in life, too, which all culminates to tip-toeing out of that warm comfort zone every now and again. 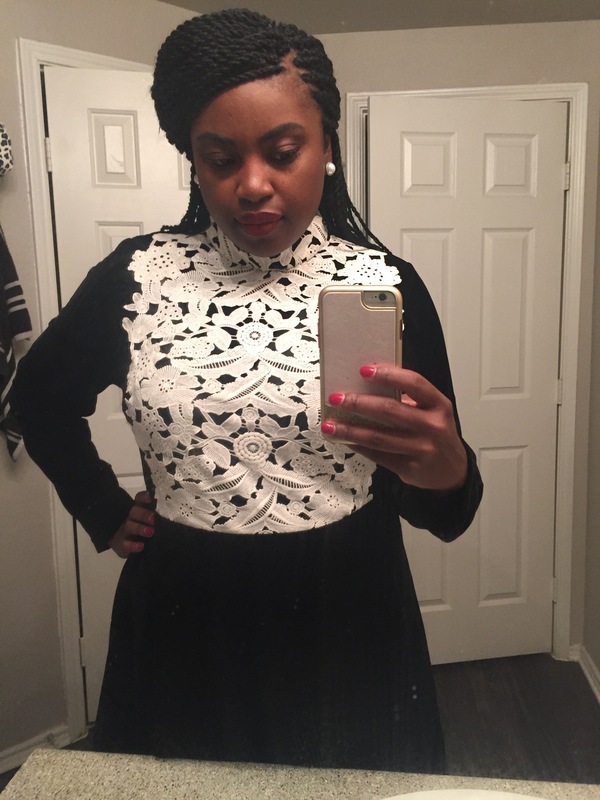 Soooo: do you have outfits that create said weird illusion? Wanna share? April 30, 2018 Categories Beauty, Fashion, Hair, Life, MeLeave a Comment on Fabu Fashion: Tasty Weekends. How was your weekend, wherever you are? Real quick: the skirt had pockets. Don’t ask me while I held my hands that way when my skirt had pockets. Le sigh. But pockets! Yes! Blouse: goodness, see above. I think Dress Barn? Years ago? Didja notice something different with my hair? Yes, I was growing it out. Yes, I planned on holding on. But y’all: the scissors and the long for change are just too powerful. 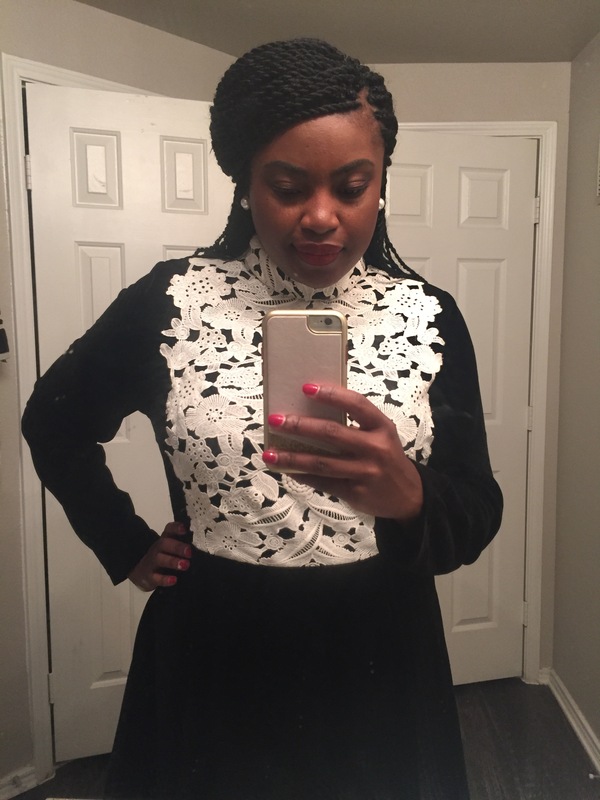 I detailed my haircut journey in my latest submission for The Maria Antoinette. When it goes live, I’ll link it here and we’ll talk about the cut in depth. Just know that I’m very happy with it and the myriad of styles that came along my way. And that was the point. Variety continues to spice up my life. Cue the music. How was your weekend? Was it delish? May 11, 2017 May 11, 2017 Categories Fashion, Me, Memory, Woman2 Comments on big bag, small bag. Once upon a time, our fair chocolate princess was at work and in the middle of typing when a sharp pain shot though her wrist. Of course, she gazed at her wrist as if the body part could communicate why it did this to her. Thankfully, there was no answer (talking body parts may be cute in animated films, but in real life? Nah), and she assumed that it would go away. No such thing. The sharp pain became unrelenting. She could barely type, hold things with her left hand, etc. At first, she diagnosed herself, because she’s done this all her life, often running to her parents’ basement to consult various medical journals whenever she experienced pain and/or discomfort, which resulted in giving herself an assortment of ailments. (“Stop doing that,” her mother has demanded many, many times in the past and last week in the not too distant past.) Her final analysis was carpal tunnel syndrome. And yet there was something intense about this pain, perhaps bigger than carpal tunnel. Reluctantly, she realized that it was time to consult a real physician. The medical journals and all those years of watching ER, St. Elsewhere, and other medical shows just wouldn’t suffice this time. But, our princess thought to herself, she’d always had big bags. High school, college: what minuscule bag would fit her life?? A backpack? Was she 11? Was she in elementary school? Was she still walking to the bus in the mornings? Obviously the doctor saw the horrified (mixed with a bit of snobbery) expression on our princess’s face. “Or you can decrease the items in the bag. But you’re doing damage to your tendons if keep holding a bag that weighs this much.” She muttered her thanks and assured him that she would figure it out. He told her to pop some pain medication if the pain continued. Eventually, the pain dissipated and disappeared and our princess resumed her life. But she didn’t change her bag. So I had an epiphany the other day, dear reader. After years of rubbing my shoulder after wearing my bag, or picking up my bag and wincing in pain, or warning the lady at the nail shop to be careful when she picks up my bag in order to protect my wet nails, and so, so on, I realized that it’s finally time to quit playing games with my limbs. Stubbornly refusing to listen to the doctor’s recommendations was one thing (and not a great thing). But now living in an area where I drive to work and no longer need to be loaded down with an entire aisle of a CVS because I can leave things in my car is entirely another. It’s time, y’all. This Square Peg needs to buy a smaller purse. I used to wonder how women ran their lives with smaller purses. Like, how did they exist? Where did they put their wallets in said smaller bag? What about a certain time of the month and hiding certain items? (Speaking of that, I think the trauma of a boy in my 9th grade History class who snatched my bag one day and peeked in to see a row of pink lady time-of-the-month articles did more damage than I care to psychoanalyze.) Anyway, again: how did these ladies survive without a giant bag on their shoulders? Lovely. Now we need to head to the store. I wonder how many years that will take? So tell me: what kind of purse/handbag do you use? Small? Large? Massive? Little? Share your adjectives in the comments with me, please. February 1, 2017 Categories Beauty, Fashion, Life, Me, WomanLeave a Comment on slay-o’clock. Well, it was bound to happen. I fell off the wagon. I went back 100 steps. I lost the mojo. In other words: I returned to my sloppily-dressed ways. I’ve mentioned to you that way back in the day, because of weight and lack of self-esteem and not really knowing who I was as a woman, I preferred the drab, large sized, Stevie Nicks/Dorothy Zbornak look. It was my way of hiding. Yet as much as I love Stevie and my Dorothy, it wasn’t the best idea. But with time and working on the inside and then turning to the outside, all of that improved. I fell in love with me, which ultimately meant buying her (me) fancy, lovely things, like clothes that actually fit and creating a simple, feminine and chicelegant (new word; save it in your dictionaries, folks) sense of style. Of late, however, the blah of life translated to fashion, style, everything. The return of ill-fitted, voluminous pants. Going to work with not one stitch of makeup on, not even my trusty MAC Studio Fix. Feeling like a shapeless brown platypus. As I’m prone to do, I had to figure out what was going on inside before the outside. I’ve been through some recent changes that have affected me emotionally. Idris still hasn’t called me. You know: things like that. In all seriousness, dear readers, I was going through stuff. And stuff means grabbing some parachute pants (far less awesome than Hammer’s), throwing them on, and going to work. But it’s time to let it all go. I saw myself in the mirror yesterday, super fresh-faced, absent of even lip balm, for goodness sakes (chapped lips to the heavens), and told myself to wake up. Stuff happens. We deal with it as we go. But no more cracked lips, y’all. No more. So what time is it? It’s slay-o’clock. Because looking my best leads to feeling my best. A fundamental truth. We all know it. It’s not new math or the invention of something that will keep these edges laid. Looking better makes me feel better. In that vein, this morning I put on a cuter dress, put on some red lippie, and I welcomed the day. Put on your slay clock and join me, won’t you? Now your turn: did the blah of life ever affect your personal style? What did you do about it? 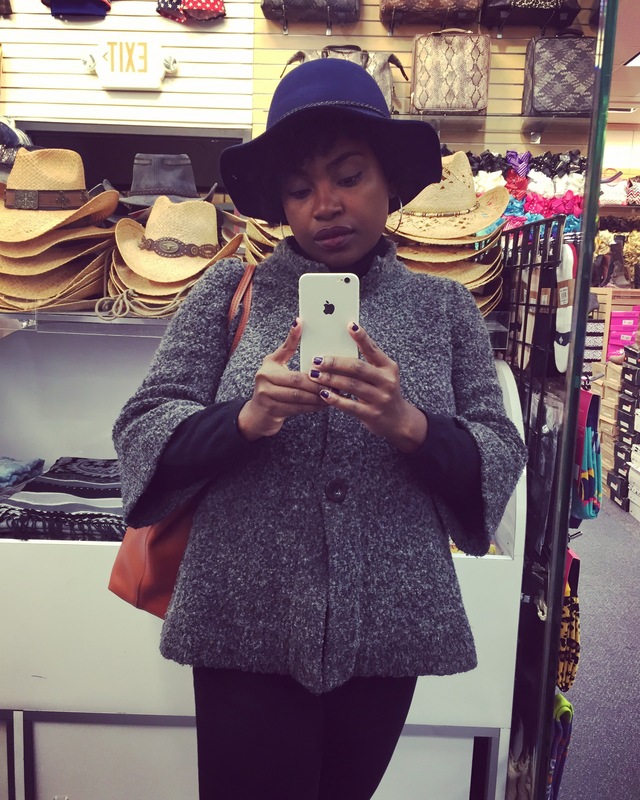 Fabu Fashion Tuesday: What is that? Velvet? December 20, 2016 December 20, 2016 Categories Beauty, Fashion, Hair, Me, Woman2 Comments on Fabu Fashion Tuesday: What is that? Velvet? If you know that line from Coming to America, then yes, you belong here. 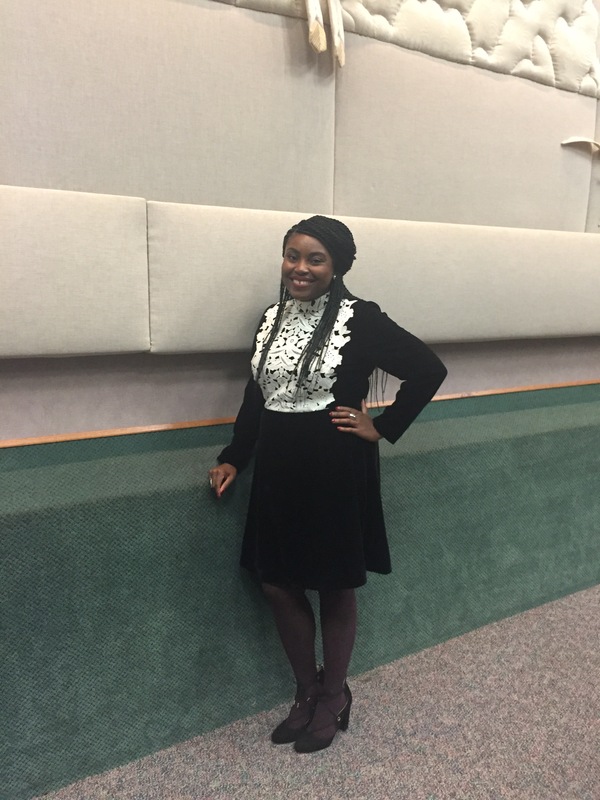 So yes, I wore a velvet dress this past weekend for a special worship event. This is notable because I’ve never worn the fabric. Not even when it was the it thing to wear in the 90s. (By the way, a friend commented on my “retro” look, to which I could only chuckle. Not the look I was going for, but whatever works.) But when I saw this velvet and lace dress on Asos one morning, I had to have. It was thoroughly unique, and you shall see why. Right?? Doesn’t that lace front and high collar take you back to Victorian times? I was hooked, lined, and sinkered. Now here’s me. I didn’t do too much by way of accessories. To me, the dress was enough pièce de résistance. A pair of pearl posts (which belonged to Sally at the seashore), some fashion rings, and that’s all she wore as far as accessories. (And I didn’t lose any of them! This tends to be a problem. Huzzah!) I snagged some awesome tights by Jessica Simpson from DSW (she should really stick to this fashion thing and stay away from music) and bought those hot shoes you see on my feet from DSW, as well. A lovely, faith-strengthening day was had. As you can also see: the fro has been tucked away under those Senegalese twists for the next several weeks. She needs to rest. We’ll talk about She later. 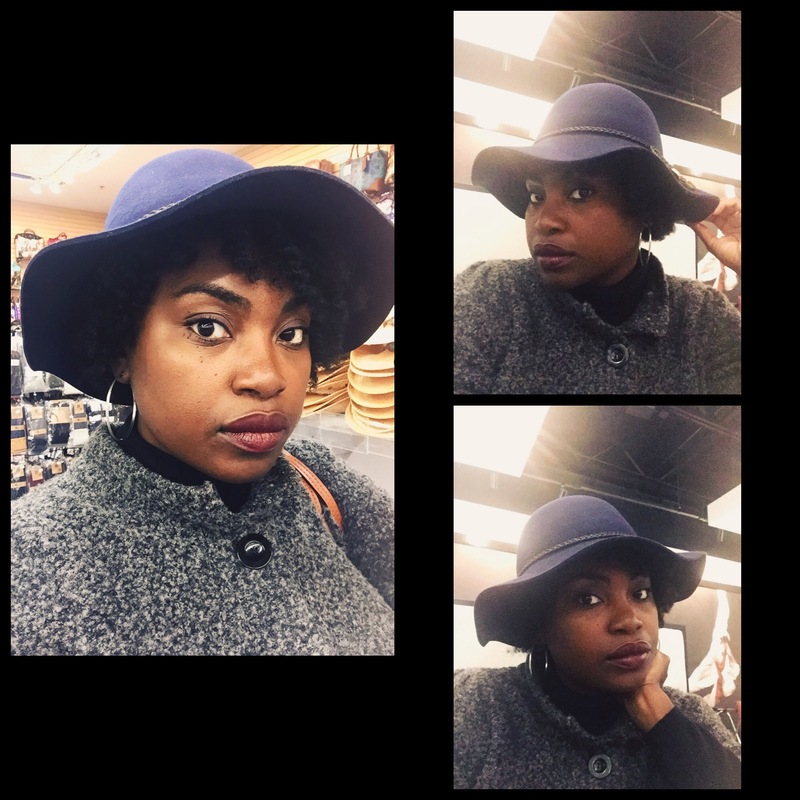 November 14, 2016 Categories Autumn, Beauty, Fashion, Hair, WomanLeave a Comment on Blogvember #14: Le Fro and Le Chapeau.